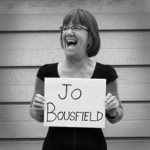 We have received this review of the Life Legacy screening as part of the Stroud Film Festival (see this earlier posting) from Jo Bousfield, poet, performer and director of Flies on the Wall youth theatre. I have always felt that the best way of living my life would be to be able to integrate work and the ‘personal’, so that there is hardly a distinction; attempting to have an organic seamless flow where I wouldn’t have to put my heart on ‘hold’ when going about my ‘paid work’. Jane Harris and Jimmy Edmonds seem to have achieved this. 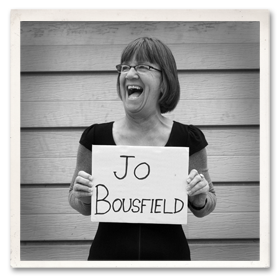 Their professional lives as filmaker (Jimmy) and therapist (Jane) have combined to embrace personal life events. Together they have created documentaries in which they are both film makers and therapists, in which, through their art form (film), they explore the depths of life, death, bereavement, aging and Alzheimer’s, creating an environment of ‘listening’ in which the film participants and audience can explore their own feelings around these subjects (therapy). As filmakers, they use their art form to communicate powerful ideas. As people they share their discoveries as they attempt to make the best possible sense of what is occurring in their lives. 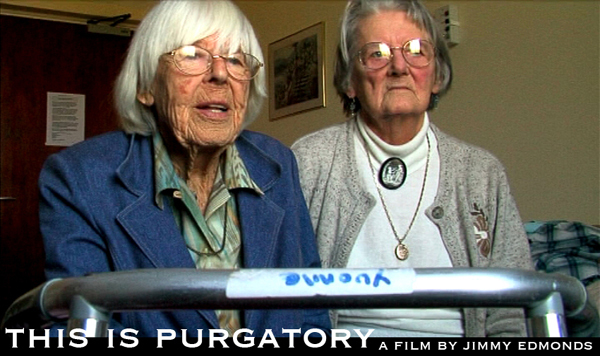 As part of Stroud Film Festival 2015 Jane and Jimmy presented an event entitled ‘Life’s Legacy’ where they showed three films – This is Purgatory, Gerry’s Legacy and Say Their Name – followed by a discussion. The sell-out audience at Open House Hall, Painswick Inn, Stroud were captivated by their integrity, honesty , warmth, and humour. ‘This Is Purgatory’ is a very funny and wonderfully human film where Jimmy dips into various people’s lives asking them what they think purgatory is, and in so doing explores a range of attitudes to death. Purgatory in a local context is a small wood near Slad in the Stroud Valleys, Gloucestershire. Throughout the film we have recurring glimpses of the wood, rustling, cracking, moving in the wind, a timeless picture of nature doing its thing, the continuum of life, the seasons, continual birth and death. The ‘characters’ in the documentary all speak their own wisdom, and the audience watching the film chortle at the individual beauty of their attitudes to death. 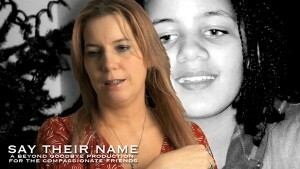 ‘Say Their Name’ introduces us to people (including Jane and Jimmy) who have a child or sibling who has died, and they talk about their loved one and how grief is for them. They have all had help from the charity ‘Compassionate Friends’ where they found a compassionate ‘home’ to take their feelings of isolation. The film is beautifully constructed and filmed, and helps sweep away some of the fear and agony people assume around the ‘unmentionable’ – the death of a child. 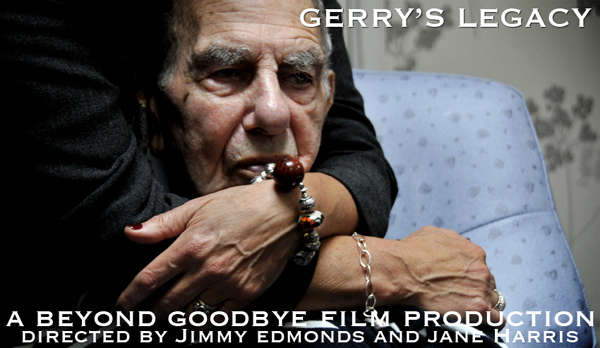 ‘Gerry’s Legacy’ is the wonderfully filmed and edited documentation of Jane grappling with her father’s deep frustration trapped in an inadequate mental health system, whereby he has no opportunity to be the person he needs to be. His memory is limited and he is very confused and lost. He visibly relaxes and engages when his daughter (and wife) visit, but the institution he is in, is unable to offer any such balm. The film is pitched beautifully in that no one is pointing a finger at anyone and blaming, but the picture is clear; an ugly, barren environment, a frightened frustrated man, an unwieldy system, and an unnecessarily tragic few years for someone that had previously led a full active life. 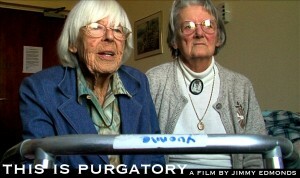 The film was funded by The Alzheimer’s Society and is now used in training programmes. Things can only get better if Jane and Jimmy continue to use their skills to inform and educate through film, the big taboos in British society; showing and respecting humane interaction and the care for our rapidly rising community of elders living with dementia; and accepting grief as a natural part of life. I was unsure about taking my 82 year old Mum to the film night on Saturday. She has a fear of dementia and I wondered how she would react to the film about your Dad. Walking home afterwards, she said how affected she was by ‘Say their Name’ in particular, making her think more deeply about her mother’s (and her own) reaction to her sister’s death age 18 in a car crash in the 1950’s. She and her mother both struggled with their grief alone, with relatives, friends and school friends acting as if Monica had never existed. My grandmother took my 16 year old mum out of school and travelled the world trying to escape anything that reminded her of her dead daughter. I knew a little about my Aunt Monica but after the film we were able to talk about my Mum’s feelings as a sibling in more depth. Losing her sister – and particularly the aftermath – blighted my Mum’s life – if people like the Compassionate Friends had been involved to support her and her mother in their grief, it may have been different.